In a change from her day job, Kilsby Williams tax manager Rachael Day fuelled her spirit for adventure by taking part in a trek along the Great Wall of China for five days to raise vital funds for charity. After hearing about an opportunity to use her passion for hiking to raise money for charity, Rachel jumped at the chance to take on the challenge with her partner Alastair and his colleagues at Ensono. She quickly decided to join the Caerphilly-based IT Consultants team and hike a challenging 35km of the world’s longest wall. As part of the Ensono team, Rachael helped raise over £20,000, doubling the original target of £10,000. This incredible amount exceeded the team’s expectations. They will now donate over £10,000 to each of their charities of choice: Tŷ Hafan and Shooting Star Chase. 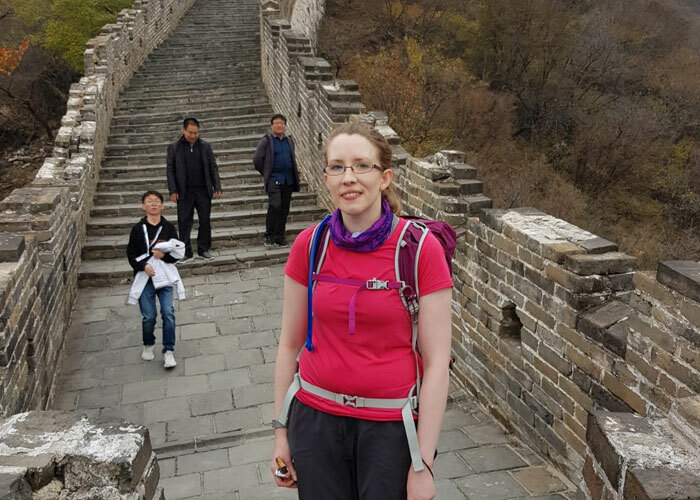 As well as raising significant funds and meeting ambitious fitness goals, the hike enabled Rachael to experience the Great Wall of China in all its glory. From trekking through approximately 75 watchtowers, taking on the 460 steps up the Heavenly Ladder, to helping rebuild part of the wall, it became the experience of a lifetime. “It was an incredible challenge and I enjoyed every minute of it. The views were fantastic, I had never seen anything like it. The trek was very tough on the legs as the climb wasn’t flat and the height of some of the steps came up to my knees. Having ticked The Great Wall of China off her bucket list, Rachael is already looking for her next challenge. This isn’t the first time members of the Kilsby Williams team have taken on tough physical challenges. The Newport-based accountancy and tax experts are slowly making a name for themselves in the sport industry, taking part in many sport events throughout the year, including Cyclone 24. “Everyone at Kilsby Williams is incredibly proud of Rachael. To take on this physical challenge and raise funds for charity is truly inspiring. The charity event was organised by Global Adventure Challenges.